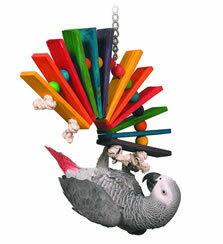 Super Bird Creations bird toys are recognized by bird enthusiasts as some of the safest available on the market. Since 1992 we have been intently focused on designing hundreds of original toys and products to address the instinctual and behavioral needs of companion birds. Super Bird Creations is clearly the avian expert's choice for bird toys. Our toy designs utilize a diverse selection of stimulating materials and encompass all of the critical destructible, interactive, comfort, exercise and foraging toy categories necessary to ensure the mental and physical well-being of pet birds. Our product line consists of a variety of innovative products including: bird toys, swings, bungees, shower perches, snugglies, foraging toys and bulk bird toy parts. Whether you are looking for a toy for a parrotlet or a macaw we have you covered. • Knowledge of your bird's individual toy personality and play style. As a pet in captivity, birds don’t have the opportunity to engage in the activities that they naturally would in the wild. Avian behaviorists who have spent time observing parrots in the wild have reported that playtime ranks second only to food gathering in priority. Birds have a natural craving to chew and a daily need to forage for food. In the wild, a parrot’s behavior is very active and playful. They have been observed stripping bark off trees, biting off and flinging leaves and twigs, swinging from and climbing on vines all the while chattering gleefully with the rest of the flock. Instinctively, companion birds are still very much like their wild counterparts.